Revealing mistake: In the scene when the main character is in the library on the internet, she goes to a couple of websites. When the shot shows the URL up top, it is C:\windows98\mydocuments\etc.html. Instead of actually searching on the web they used a premade html page and accessed it from their computer. Continuity mistake: Samara, as seen in the psychiatric sessions on the videotape, has a prominent gap in her front teeth - yet when she decomposes in Rachel's arms down in the well, the skull that is left has perfect teeth with no visible gap. Factual error: In the scene where Noah analyses the tape, he says that the 'timecode' seems to be invalid and says that every tape has a track where you can see what device was used to record it, etc. 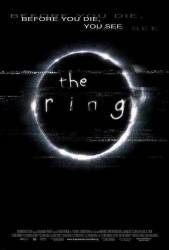 The video technology explanation originates from the original, Ringu, with the plot of The Ring changed to make it more applicable to average Americans. But a VHS tape does not have a special track for timecode. It is possible to lay a timecode onto the tape in either an analogue form via a special audio channel, or as digital information on lines 16 and 18 of the vertical interval. But this 'timecode' is only used for professional video editing. A standard VCR, like the one they were playing the tape on, does not use this, and therefore makes Noah's explanation a minute of utter nonsense. Revealing mistake: When Rachel is racing to save Noah, she is trying to call him on her cell phone. There is a shot of two hands on the steering wheel as the car turns and then a cut to her holding the phone in one hand a split second later while she was talking the entire time, showing that the shot with both hands was a stunt double and not her. Continuity mistake: In the extra/cut scenes included on the DVD, there is one where Rachel is in Katie's room snooping around. She goes over to the cabinet that has the TV on it and opens the top drawer, rummaging through it. After looking, she closes the BOTTOM drawer even though she was looking through the top one in the previous shot. Deliberate mistake: When Noah drops Rachel off at the ferry he drives right up the the gate at the dock which is strictly prohibited by Washington State Ferries. The only cars allowed in this area are the ones who are boarding the boat, no exceptions. Factual error: The license plate on Rachel's car is not a valid Washington State license plate, while similar to the very outdated original issue plates, which would have never been issued on such a new car, they are missing tabs on the front which were mandatory on those plates and all Washington plates in 2002 when the movie was filmed. Continuity mistake: When Rachel is approaching the top of the ladder upon entering Samara's room at the stable, the camera is following her from behind and it shows her reach the top and wait there for a few seconds, yet when the camera shows a front on shot, she hasn't reached the top yet. Factual error: When Rachel and Noah end up back at Shelter Mountain Inn, Noah rips up the floor with an ax. When he tosses the cicle cutout of wood planks, there are no floor joist remnants still attached underneath them. Floor joists are necessary for support, otherwise the floor would not have even held up under the weight of a person walking under them. Also, there would be no point in nailing through the planks if there was nothing to nail into. Deliberate mistake: When Rachel researches Anna Morgan in the Seattle PI newspaper archives she looks through hardback books. The PI has not only been using microfilm and computer archives for years but archives are available on line at www.seattlepi.com. Continuity mistake: Rachel goes to the lodge reception and the clerk points out the tape collection to her. She turns and is drawn to The Tape in the centre of the shelf. It is lying sloping up to the left, label spine outwards, spools on the left. When Rachel picks it up to drop it into her bag, it is spools to the right, label spine inwards. Visible crew/equipment: In the end, when we see the closeup of Samara's eye, you can see several white sheets used to reflect light into her face, as well as the reflection of the camera, in dead center of her pupil. Dr. Scott: You don't want to hurt anyone. Samara Morgan: But I do, and I'm sorry. It won't stop. Everyone will suffer. Between some scenes you can see a flash of the ring, as seen at the beginning of the tape (and what Rachel sees when she looks up in the well as the lid is pushed back on).